I WAS unpleasantly surprised, over the past few days, to see Lumka Oliphant make another appearance with her middle finger still up in our faces, only weeks after she apparently apologised for insulting people who failed to appreciate the magic that she seems to see in the eyes of her political principal, Social Development Minister Bathabile Dlamini. I was convinced that Oliphant would have been booked into a specialised anger management facility following her unjustified, unprofessional Twitter rant of a few weeks ago. Perhaps they had booked her in but someone omitted to stipulate that she also had attitude issues that needed sorting out. Let’s remember right at the start that Minister Dlamini and her trusted spokesperson, Oliphant, are employed by the people of South Africa. Let us also remember that we live in a constitutional democracy in which we should all subject ourselves to the rule of law, irrespective of the images of grandeur that some of us see from time to time when we glance into our mirrors. The minister might have been appointed by the president, at whose pleasure we all know she serves. But she is the servant of the people of South Africa and she owes her allegiance to the country, its institutions and its people before her political masters, despite what her own thinking might dictate to her. Oliphant, on the other hand, is a civil servant located further down the pecking order; an employee of government whose jobs it is to serve as a communication bridge between the activities of her employer, a government department, and us, the people of this country. It is hard, considering her recent conduct, not to suspect that her longevity in her current position has gone to her head and is now making her believe she is a politician, not a civil servant. Worse still, she carries on as if she were a spoiled child employed in a family-owned corner shop. The first issue to consider is the Constitutional Court ruling. The highest court in our country ruled in 2014 that the South African Social Security Agency’s contract with Cash Paymaster Services was unlawful because the tender awarded to the latter was invalid. Because it is the highest court in the land, also referred to as the court of last instance, rulings of the Constitutional Court cannot be second guessed and appealed, even by politicians; they have to be adhered to. The Department of Social Services and Sassa were wrong to have sat on the Constitutional Court ruling for almost two years without doing anything to correct their conduct. They do not deserve our sympathy for asking the Constitutional Court to allow them two more years to shove their dirty middle fingers in its face. This matter of legality can therefore not be wished away, because it sits right at the heart of the kind of democracy we’re striving to be. The second issue is that of language use. It appears that some people allowed themselves to be swayed by Lumka Oliphant’s opportunistic appeal for sympathy when she told Radio 702’s Xolani Gwala that she was tired of speaking English at the expense – ostensibly – of local African languages. There is no doubt that it remains strange that many “non-Black” South Africans who consider themselves of this country still seem to shun local African languages. I personally know French and Belgian friends who arrived in this country from Europe and, within time, became fluent speakers of Zulu, Sotho and Xhosa because they wanted to. Recently, a Chinese man living in Durban was recorded speaking Zulu like a local. No doubt, the language issue persists and should continue receiving the attention it deserves; but it should not be used to side track us from burning issues that have nothing to do with it. Having accepted an interview on an English medium radio station – despite the enduring language issue described above – Oliphant had no right to insist on being interviewed in Zulu or Xhosa, given the station’s broad audience base. Her supporters would not have sympathised with her insistence on being interviewed in English on Radio Zibonele, Ukhozi FM, etc. The third issue to consider is that of political arrogance. 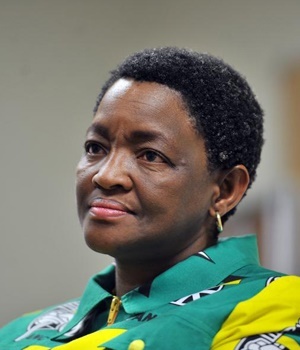 Minister Bathabile Dlamini often seems to struggle separating party from state. As minister, she represents all the people of South Africa, not only the supporters of the political party that deployed her to government. Her utterances often leave one with the impression that to her nothing else matters, as long as she continues to enjoy the protection of her political bosses and the support of followers in the ANC Women’s League. She will remain a reputational liability to her political party and to the current government for as long as she fails to wake up to the need to respect our institutions, to humble herself a bit more in front of the taxpayers, and to be transparent in her dealings and those of the department she leads on our behalf. We all want social grants to be paid to all lawful recipients on a regular basis; but meeting this monthly obligation does not make it right to ignore court orders and to flaunt carefully established rules of transparency in managing the affairs of the country, especially the Public Finance Management Act and other related acts. It also doesn’t give government spokespersons the right to insult South Africans and speak over their heads. Those who cannot handle the pressure of demanding public sector responsibilities should consider looking for easier jobs outside public service. There is enough expertise and talent in South Africa to do the work that needs to be done to carry our country forward. Hi there,I read your blogs named "DonValley Marketing & Communications | Serve SA before your political masters, Bathabile Dlamini - DonValley Marketing & Communications" regularly.Your writing style is witty, keep it up! And you can look our website about تحميل اغانى.